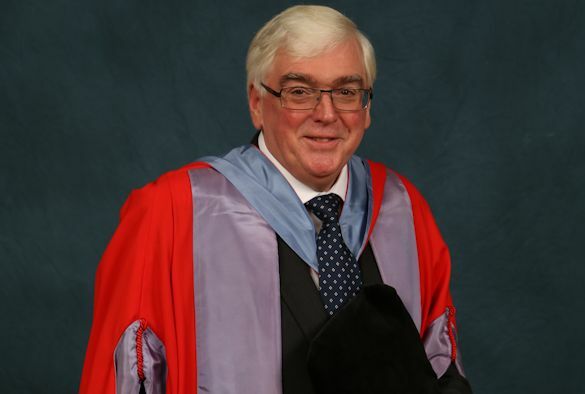 The University and the Department of Chemistry are saddened to learn of the passing of Professor Paul O’Brien, Honorary Graduate and former Student of the University and an Elected Fellow of The Royal Society. Professor O’Brien was the co-founder of Nanoco, a leading nanotechnology company, and a Professor of Inorganic Materials at the University of Manchester. He served as Research Dean at the Victoria University of Manchester from 2000 to 2002 and as Head of the Department and subsequently School of Chemistry through the formation of the new University from 2002 to 2009. He also worked at Chelsea, Queen Mary and Imperial Colleges, as a visiting Professor at Georgia Tech and was IAS Fellow at Collingwood College, Durham University in 2011. In addition to his University of Liverpool qualifications, he held a PhD in Inorganic Chemistry from University College Cardiff (1978). Elected as a Fellow of The Royal Society in May 2013, he was also the recipient of the A.G. Evans Memorial Medal from University College Cardiff, the Kroll Award from the Institute of Materials, Minerals and Mining (IOMMM) for process chemistry in 2007 and the first Peter Day Award of the Royal Society of Chemistry (RSC) for Materials Chemistry in 2009. He received a CBE in the New Year Honours 2016 for services to science and engineering. Professor O’Brien was awarded the Potts Chemistry Medal by the University in 2001 and in recent years supported the revival of the medal.